End-to-end enterprise resource planning (ERP) for large and medium-size enterprise organisations. Microsoft Dynamics AX, formerly Axapta and also known as AX system, is a comprehensive end-to-end enterprise resource planning (ERP) solution for midsize and large organisations. The Microsoft Dynamics AX solution delivers value faster by maximising your customer engagement, simplifying business processes and operations across your organisation, and providing users with a familiar and easy to learn system. Microsoft Dynamics AX is a multi-language and multi-currency ERP with comprehensive global business management features for financials, human resources, and operations management. The AX system (ax system) has industry capabilities for Retailers, Professional Service industries, Financial Service businesses, Manufacturers, Public sector organisations. Microsoft Dynamics AX offers powerful manufacturing features for process manufacturing businesses amongst them real-time insight into inventory, warehouse, production that allows production flow optimisation, improved resource utilisation and enhanced process efficiencies. Today customers have never been as demanding, the supply chain has never been as complex and your competition has never been as strong – Dynamics AX for Wholesale Distribution provides you with an end-to-end Wholesale Distribution solution to help reduces your daily pressures, increase efficiency, keep your customers happy, and drive more profit. Cut costs and repurpose overheads by streamlining order processing and warehousing. Improve forecasting to reduce inventory levels and optimize collaboration with supply chain partners. Increase your agility to respond to changing market dynamics. Seize opportunities ahead of your competitors. Gain complete insight into your global operations, inreal-time. Enable easy financial reporting across multiple entities. Protect margins by creating more business opportunities with sophisticated tools that support differentiated pricing and service strategies by customer segment. Manage rebates to leverage your position in the supply chain. Increase customer satisfaction with tools that flexibly control pricing, service levels, product availability and delivery performance. Provide a full range of ordering options including web-based, catalogue and direct to consumer. Automate your business critical processes to increase productivity and effectiveness. Perform better budgeting with historical transactions, project budget and more. Integrate sales and purchasing processes with other key functional areas. Manage inventory and purchasing, perform forecasting and tracking of inventory. Streamline your manufacturing processes and supply chain. Real time insight into your manufacturing processes to increase efficiency and profitability. Provides you with overview of entire organisation and strategic tools to develop human resources. Powerful capability to management ravel and otehr business expenses. Improve your business performance through enhanced financial reporting. 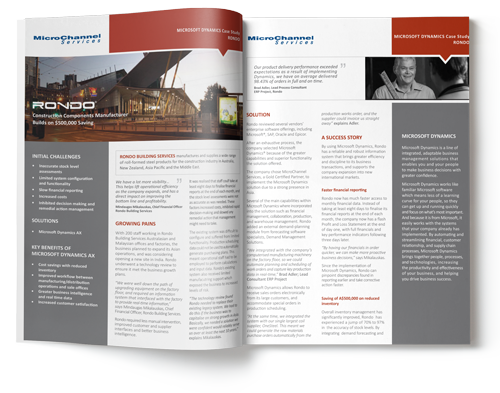 Rondo is amongst our list of satisfied Microsoft Dynamics AX customers. Rondo manufactures and supplies roll formed steel products to make specialist ceilings and walls.